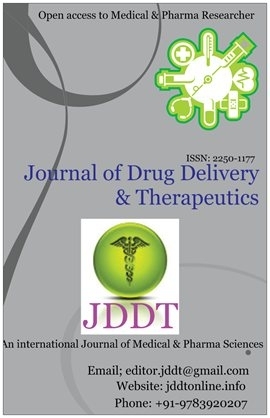 Journal of Drug Delivery and Therapeutics (JDDT), ISSN: 2250-1177, a peer-reviewed international pharmaceutical and Medical Sciencel journal, scheduled to appear Bi-monthly and serve as a medium for scientific information exchange in the international pharmaceutical forum. This publication serves about 1,000 writers nationwide and publishes 6 times per year. Of the journal in this gallery, they are publishes full length research reports, review articles, Short communications, Book Review, scientific commentaries & communication on all aspects of the pharmaceutical sciences with strong sciences with strong emphasis on novelty, originality and scientific quality.